4th Annual Mowgli Memorial Dog Show presented by the GNCC Kennel Club. • Classes: Pro (registered pedigrees), 4-Stroke (51+ lbs), 2-Stroke (16<50 lbs), Lites (terriers, miniatures, foo foo dogs, 0<15 lbs), Utility (shepherds, labs, retrievers, service dogs), Senior (10+ years), Micro (puppies 0<1 year). • Judged On: Appearance, Agility (performance, obstacles), Attire (costumes). 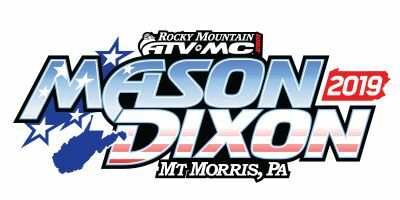 GNCC Racing continues at Mathews Farm in Mount Morris, PA for the Mason-Dixon GNCC. This facility is located across the street from the iconic High Point Raceway, home of the High Point Pro Motocross National since 1977. As an added bonus, plans are to incorporate the High Point Raceway facility into the racecourse, which would also mark GNCC Racing’s return to High Point for the first time since 2002! Since the last Mathews Farm event, the land has not hosted any sort of racing event and the woods are back to a virgin state. This means that possibilities are nearly endless in terms of what types of trails you will encounter on the course. This area of southern Pennsylvania is not overly rocky so don’t expect much rock. However, the rolling hills of the area can make for some fun hillclimbs. As usual, we want to incorporate a mix of open trail, tight single track trail, and some fun flowing trail into the Mathews Farm course, and this facility gives a lot of opportunity for some fun grass track sections as well. There’s no doubt that this event has the potential to become a popular addition to the GNCC schedule amongst riders and fans alike!